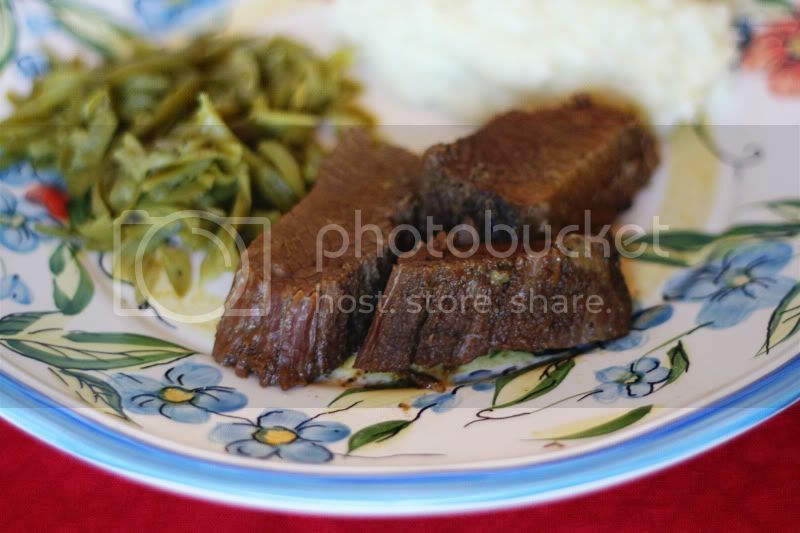 My newest obsession: Beef Brisket. 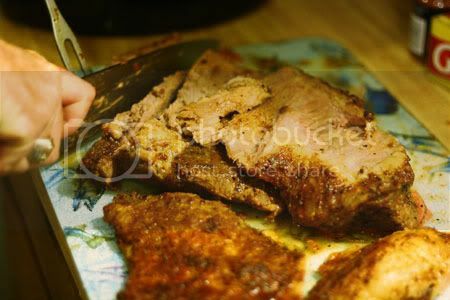 I just love the process involved in cooking a brisket — the slow roasting that fills your home with juicy, tempting smells. And this recipe is great. You make the brisket a couple of days before serving it, then re-heat it using a crock pot. It’s totally worth the extra effort because the flavors really have time to sink into the meat. 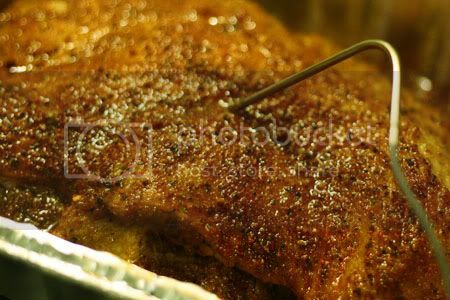 The first thing you’ve got to do is dry rub the meat with the first kind of fajita seasoning or brisket rub. Work it into the meat on both sides with your fingers (it gets kind of messy. 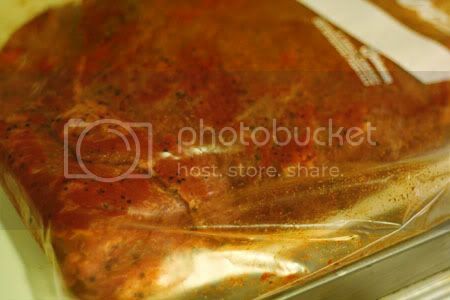 Then, transfer the brisket to a Ziploc bag (I used a 2 gallon bag)and store it in the refrigerator overnight. In the morning, put the brisket in a throw-away aluminum pan, fat-side up to cook. 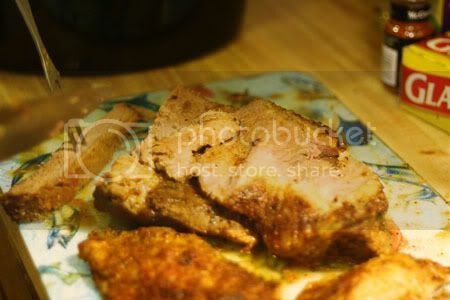 Sprinkle it with barbecue seasoning on both sides. Preheat your over to 225 degrees and insert a digital meat thermometer into the middle of the brisket, about half-way through. 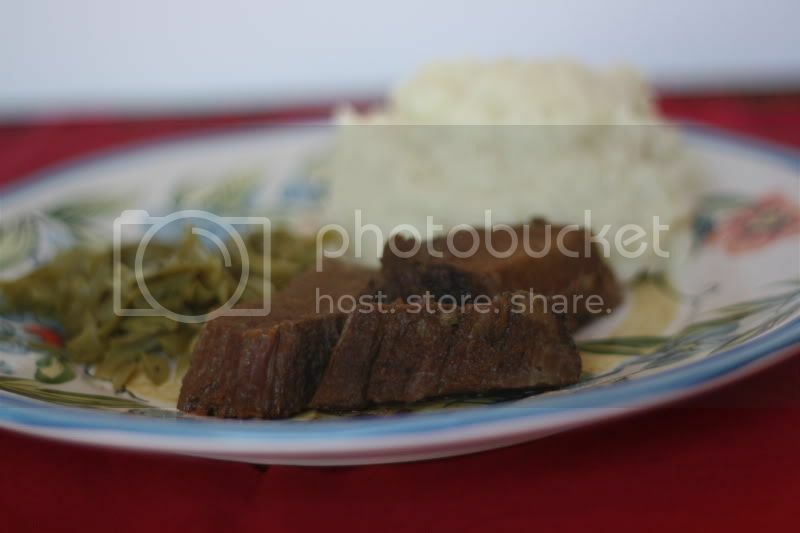 Cook the brisket uncovered until it reaches an internal temperature of 170 degrees. It took about three hours for the 6-pound brisket I made to do so. 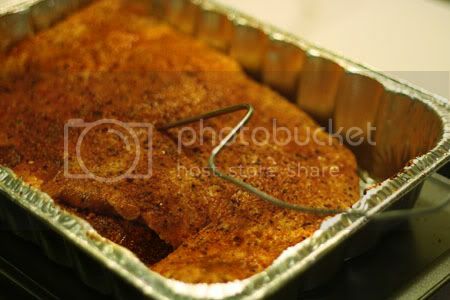 Then, pull it out of the oven and sprinkle the McCormick’s fajita seasoning on the top. Pour about 1/4 cup of apple juice on top of the brisket. 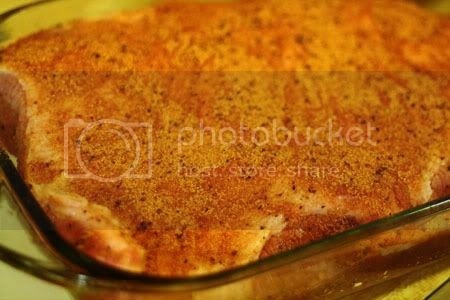 Cover with foil and return to the oven until it reaches an internal temperature of 190 degrees. Turn the oven off and let it rest for 2 hours. 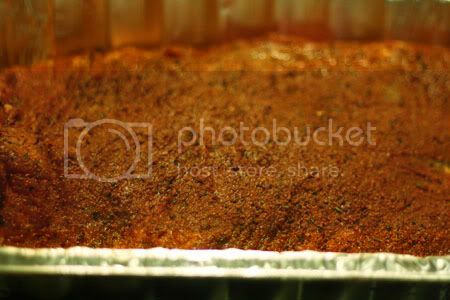 When you finally pull the foil off the top, it will look juicy and golden like this. Remove the brisket from the juices and slice, against the grain. That’s my Dad wielding the butcher knife there. Thanks for being a great model, Dad! Put the slices in a crock pot with a removable ceramic crock. Cover and let sit in the refrigerator until the day of serving. Collect the juices in a separate jar or measuring cup and do the same. When you’re ready to serve, remove the fat from the top of the juices and pour over the brisket in the crock. Re-heat on Low for 3 to 4 hours.